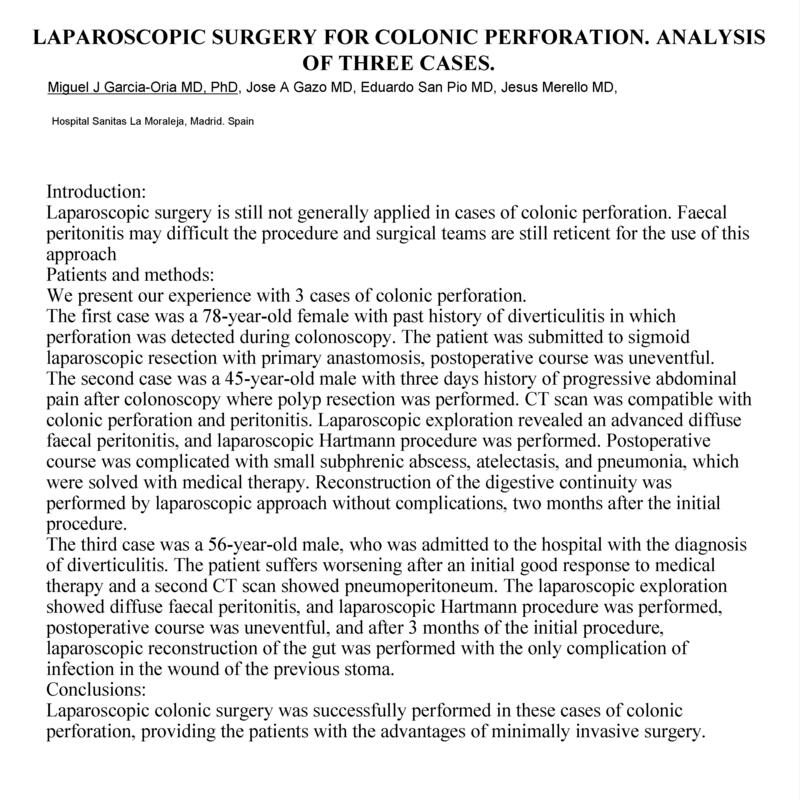 Laparoscopic Surgery for Colonic Perforation. Analysis of Three Cases. We present our experience with 3 cases of colonic perforation. The first case was a 78-year-old female with past history of diverticulitis in which perforation was detected during colonoscopy. The patient was submitted to sigmoid laparoscopic resection with primary anastomosis, postoperative course was uneventful. The second case was a 45-year-old male with three days history of progressive abdominal pain after colonoscopy where polyp resection was performed. CT scan was compatible with colonic perforation and peritonitis. Laparoscopic exploration revealed an advanced diffuse faecal peritonitis, and laparoscopic Hartmann procedure was performed. Postoperative course was complicated with small subphrenic abscess, atelectasis, and pneumonia, which were solved with medical therapy. Reconstruction of the digestive continuity was performed by laparoscopic approach without complications, two months after the initial procedure. The third case was a 56-year-old male, who was admitted to the hospital with the diagnosis of diverticulitis. The patient suffers worsening after an initial good response to medical therapy and a second CT scan showed pneumoperitoneum. The laparoscopic exploration showed diffuse faecal peritonitis, and laparoscopic Hartmann procedure was performed, postoperative course was uneventful, and after 3 months of the initial procedure, laparoscopic reconstruction of the gut was performed with the only complication of infection in the wound of the previous stoma. Laparoscopic colonic surgery was successfully performed in these cases of colonic perforation, providing the patients with the advantages of minimally invasive surgery.